School districts are developing policies to capitalize on the new abundance of devices and ensure that students use them to learn deeply and prepare for the future. The goal is to redefine learning in order for students to achieve more – not just higher scores but also 21st century skills and knowledge. What districts decide in terms of devices, tools, content, professional development, and management have long-range effects on student learning. 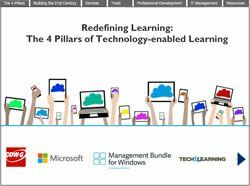 This eBook provides a guide to practices that help districts redefine learning with help from Microsoft, CDWG and Lightspeed Systems. The keys to success are the 4 pillars of technology-enabled learning: Devices, Tools, Professional Development, and IT Solutions.